American astronaut Buzz Aldrin made history when he became the second man to walk on the moon in 1969, just after Neil Armstrong in the Apollo 11 missionee. While on a previous mission, Aldrin established a record for extravehicular activity and helped pioneer underwater training to prepare astronauts for their visit to space. He continues to serve as a spokesperson for space exploration, well into his 80s..
Born on Jan. 20, 1930, in New Jersey as Edwin Eugene Aldrin Jr., the astronaut received his nickname "Buzz" when his little sister pronounced the word brother as "buzzer." The family shortened it to Buzz, which Aldrin took as his legal name in 1988. 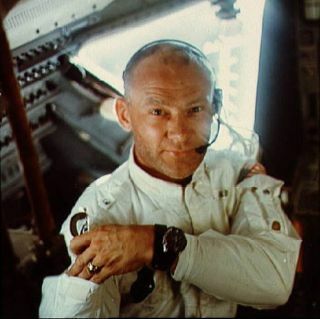 Aldrin's father was a colonel in the Air Force, and asked his son to attend a multiengine flight school so that Buzz could command his own flight crew, according to History.com. Buzz, however, wanted to be a fighter pilot. He entered the Air Force after his graduation from West Point Military Academy in 1951. Because Neil Armstrong was responsible for recording images on the moon, most of the Apollo 11 photos are of Buzz Aldrin, including this famous one which reflects the landing vehicle. Buzz flew 66 combat missions in Korea with the 51st Fighter Wing. Using an F-86 Sabre Jet, he shot down two MiGs. He was decorated with the Distinguished Flying Cross for his service. After the cease-fire between North and South Korea, Aldrin enrolled at the Massachusetts Institute of Technology. He earned his doctorate in aeronautics and astronautics in 1963, with a thesis called "Line-of-sight guidance techniques for manned orbital rendezvous," focusing on rendezvousing piloted spacecraft. He then entered the space program in 1963, as part of the third group of astronauts that mainly flew Gemini and Apollo missions..
On Nov. 11, 1966, the Gemini 12 mission launched Aldrin and command pilot James Lovell (of Apollo 13 fame) into a four-day flight, with the primary objective of rendezvousing and docking with an Agena target vehicle, as well as evaluating extravehicular activity. Aldrin spent five and a half hours outside of the craft, establishing a record for space walks . Fourteen scientific experiments were also performed. Gemini 12 was the last of the Gemini missionsg . Aldrin served as lunar module pilot for the Apollo 11 mission to the moon, traveling with Commander Neil Armstrong and Command Module Pilot Michael Collins. The craft landed in the Sea of Tranquility. On July 21, 1969, after Armstrong had become the first man on the moon, Aldrin followed Armstrong down the ladder to become the second person to walk on the surface of the moon. As he gazed at the lunar landscape, Aldrin described it as, "Beautiful, beautiful. Magnificent desolation." One of Armstrong's roles while on the moon was to document the trip, so the majority of the Apollo 11 pictures are of Aldrin, including the famous visor shot reflecting the Eagle lander and Armstrong. Eight days after its launch, Apollo 11 returned home, landing in the Pacific Ocean on July 24, 1969. Aldrin was decorated with the Presidential Medal of Freedom, the highest American peacetime award. He toured the world with his fellow astronauts. In 1971, Aldrin resigned from NASA, having logged 289 hours and 53 minutes in space. Almost eight hours of his travel were spent outside of a vehicle. He retired from the Air Force in 1972, after almost two decades. In his 1973 autobiography, "Return to Earth," Aldrin disclosed that he had difficulties with alcoholism and depression after leaving NASA. Some of Aldrin's post-NASA activities, according to History.com, include creating an "Aldrin Mars Cycler" that could be used for human Mars missions, receiving three U.S. patents, and founding the ShareSpace Foundation, which promotes space education and exploration. In recent decades, Aldrin has used his fame to continue to lobby for the expansion of the space program, specifically calling for a return to moon and manned visits to Mars. In 2009, he called for putting humans on Mars by 2031. He somewhat famously danced on "Dancing with the Stars" and was a guest on Comedy Central's "The Colbert Report." Aldrin sat down with actor George Clooney in a 2017 short documentary called "Starmen," during which the two men watched the Apollo 11 moonwalk and shared memories. Aldrin has been married three times and has three children. In June 2018, the 88-year-old astronaut filed a lawsuit against two of his children, his family foundation and his former manager. The allegations include fraud, misuse of personal credit cards and social media accounts and slander, among other items. None of the allegations have been proven in court.